Right off the bat, these get an A+ for presentation. Each layered mousse is in an aysemmetrical shot glass that looks like something you might be served at an upscale restaurant (though the cups are plastic, not glass). 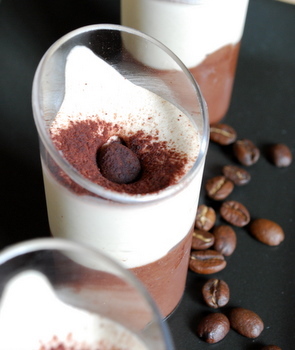 Each mousse is topped with a chocolate covered espresso bean and a dusting of cocoa powder. The espresso mousse is delicious, with a really nice, light coffee flavor and the consistency of a cloud. The chocolate mousse is quite heavy and has a slightly grainy texture to it, even after a very long defrost. It is more dominant than the espresso, but the overall combination is not bad. That said, I could eat a whole container of the espresso and wouldn’t miss the chocolate one bit – as long as I still got the chocolate covered bean on top. Speaking of defrosting, I found the defrost directions on the package to be misleading. The mousses were still icy after hours in the fridge and were definitely best when defrosted completely at room temperature (70F in my kitchen) for about an hour after taking them out of the freezer.